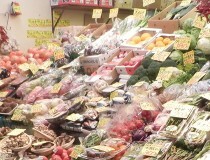 In Knazawa, there are vegetables called "Kaga yasai", that literally means "vegetables of Kaga". 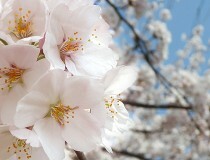 They are grown Kaga region - Kanazawa and southern part of Ishikawa prefecture. They are commonly eaten by Kanazawa local people and you can find them in Omicho market. Some local restaurants offer dishes with local vegetables. Kanazawa is famous for rain. Statistics say it rains 2,859mm in a year, 197 days of the year are raining and 57 days of the year are snowing. In total, more than two third days of the year are raining. A proverb say, "Don't forget umbrella, even if you forget lunchbox". 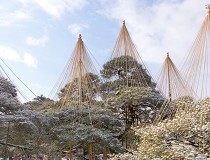 You will see something like decoration on trees if you come to Kanazawa in winter. It is an actually not decoration but protection from snow.